Here is our Summer Group Exercise Class Schedule for 2018. TruSelf Sporting Club is located at 5125 Waring Road, San Diego, 92120. We’ve added a new class called Movement for Thursdays at 4:30pm. Remember all of our Group Exercise Classes are completely free included with the membership. We have group exercises classes such as Barre, TRX, HIIT (High Intensity Interval Training), Yoga, Mat Pilates, Zumba, Movement, and Spinning. The majority of our classes are taught by our nationally recognized personal trainers so that you can receive even more instruction! 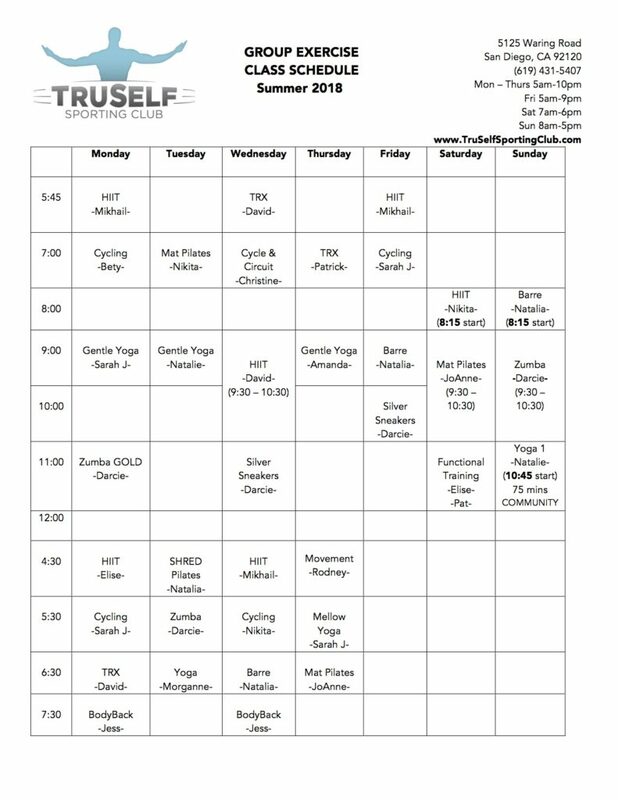 See TruSelf Sporting Club’s Free Group Exercise Class Schedule.